Good morning! 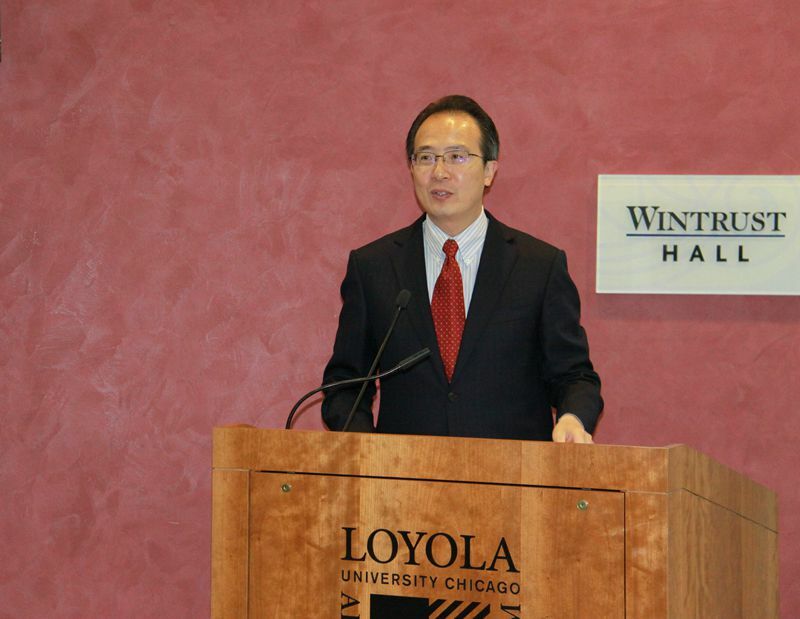 It is a great pleasure to visit Loyola University in downtown Chicago. Today is October 27. This October and the upcoming November carry special significance for China and China-US relations. The 19th National Congress of the Communist Party of China (CPC) was just concluded this week, electing the new central leadership of China and adopting fundamental strategies for China’s development for the next five years and beyond. On top of that, President Trump will pay his first state visit to China in two weeks. These two major events have all drawn world-wide interest and attention. How important is the 19th CPC National Congress in China’s development course? Where will China-US relations go at this critical juncture? To answer these questions, I will elaborate on two parts, namely China’s advances, and the development of China-US relations in my speech. As President Xi Jinping mentioned in the 19th National Congress Report, in face of the sluggish world economic recovery, regional confrontations and turmoil and aggravating global issues, as well as the domestic scenario featuring the New Normal of the Chinese economy, China has forged ahead while sustaining stability and achieved historic progress in reform and opening-up and socialist modernization. First, the Chinese economy has been developing at a relatively high speed. From 2013 to 2016, China’s GDP has grown from 54 trillion RMB to 80 trillion RMB with an annual increase of 7.2%, higher than the world average of 2.6% and developing countries’ average of 4%. China’s contribution to the world economy has exceeded 30%. The economic structure has been optimized, emerging industries such as digital economy are booming, and infrastructure building of high-speed railway, roads, bridges, ports and airports is speeding up. The urbanization rate has grown at an annual rate of 1.2 percentage points, and over 80 million rural dwellers have become urban residents. We vigorously implement the strategy of innovation-driven development and make great strides in building an innovative country, including the ground-breaking achievements of Tiangong space station, Jiaolong submersible, Sky Eye radio telescope, Wukong dark matter particle explorer, Micius quantum satellite and large passenger aircraft C919. The major drivers of China’s economic growth have shifted from mainly investment and export to consumption, investment and export, and from the secondary industry to the tertiary industry, demonstrating Chinese economy’s huge potentials for growth and vast room for the development of consumption and service industry. Second, great breakthroughs have been made in comprehensively deepening reform. We have rolled out over 1,500 reform measures to expand and deepen reform. Tangible progress has been achieved in the supply-side structural reform featuring cutting excessive industrial capacity, destocking, de-leveraging, lowering corporate costs and improving weak links. The year 2016 witnessed cutting of excessive industrial capacity of over 65 million tons in iron and steel and over 290 million tons in coal. All round efforts have been made in replacing the business tax with a value-added tax, and corporate tax costs were lowered by 1 trillion RMB in 2016. We have deepened reform in key areas, and improved our efforts in streamlining the administration, delegating power, strengthening regulation and improving service. Administrative examination and approval has been reduced by one third, and non-administrative examination and approval has been completely removed. The reform has made the Chinese people have a sense of gain through achievements ranging from poverty reduction, ecological environment improvement, winter heating, garbage sorting, pension service to streamlining administration and improving government service. Third, people’s livelihood has been constantly improved. In the past five years, China has seen an annual newly added employment of over 13 million people, creating a total of 65 million new jobs. Over 27.9 million laid-off workers were re-employed, and over 8.8 million urban low-income residents found jobs. The unemployment rate stays around 5%. China has made crucial progress in poverty alleviation by enabling 60 million people living in poverty to remain free of poverty and reducing the poverty incidence from 10.2% to below 4%. We have established the world’s largest social security net, with pension insurance covering over 900 million people and medical insurance covering over 1.3 billion. It is fair to say that China has achieved universal health care. At the end of last year, the International Social Security Association (ISSA) awarded China for our outstanding achievements in social security as a recognition of our efforts in this regard. In the past five years, Chinese government’s budget for education has increased from 2 trillion RMB to over 3 trillion, and is still growing to reach 4 trillion. Share of education input in GDP has remained 4%. A total of nearly 80 million university and vocational school graduates have joined the labor force and given a strong boost to economic development. Fourth, environmental protection has registered remarkable progress. While maintaining economic growth, China strives to change from the past economic development model at the cost of high pollution, high emissions and high consumption to a resource-efficient and environment-friendly model. With the joint efforts by the government, business and the public, China has achieved remarkable results in reducing energy consumption, optimizing the energy mix and controlling air pollution. Over the past five years, the share of coal consumption in national energy mix has decreased by 6.5 percent points, and energy consumption per unit of GDP decreased by 17.9%, saving an equivalent of 860 million tons of standard coal. By the end of 2015, the national forest area has exceeded 208 million hectares and covered 21.66% of the territory, marking the biggest increase in forest area among all countries in the past 25 years. According to the National Geographic website, China’s response to climate change and air pollution by developing renewable energy has made it a global leader in clean energy equipment manufacturing and installation and the largest contributor among all countries. Fifth, the environment for implementing the rule of law is constantly improving. The rule of law is an essential instrument of state governance. It is an important foundation of a country's governance systems and capabilities. A nation can only thrive if its legal system stands strong. Since the 18th Congress of the CPC, China has been promoting governance according to law, ruling according to law, and conducting administration according to law, making synchronized efforts to build a nation, a government, and a society based on law and expanding the scope of socialist rule of law with Chinese characteristics. Currently, China has not only constructed a legal system with the Constitution at its top, but also provided a legal framework for the society and individuals to rely on. The priority of the Chinese legal system is shifting from legislation to implementation of the Constitution and other laws. Increasingly, the governance of the ruling party and the state is being integrated into the legal framework. China's endeavor to promote the rule of law has achieved historical progress. Sixth, notable progress has been made in strengthening ruling party discipline. It takes a good blacksmith to make iron. A party and a government’s fate hinges on people’s support. In the past 5 years, the CPC has put forward a set of rules to fight against formalism, bureaucrat-ism, hedonism and extravagance, and resolutely fought against privilege. Discipline inspection work has been strengthened and fully extended to cover both central government and provincial governments. No place has been out of bounds, no ground left unturned, and no tolerance shown in the anti-corruption campaign. We have taken firm actions to “take out tigers”, “swat flies” and “hunt down foxes”. The goal of ensuring officials dare not corrupt has been basically achieved, the regulatory defenses against corruption have been consolidated, and the moral defenses against corruption are in the making. An overwhelming anti-corruption environment has taken shape. Seventh, China is increasing our contribution to the world. Over the past five years, China has implemented the “Belt and Road” initiative, launched the Asia Infrastructure Investment Bank, set up the Silk Road Foundation, and held the first Belt and Road Forum for International Cooperation. With the joint efforts of various partners in the past five years, the "Belt and Road” initiative has become an open and inclusive platform for international cooperation and a popular public product for the world. More than 100 countries and international organizations have actively participated in the initiative. From 2014 to 2016, China invested over 50 billion US dollars in nations along the Belt and Road and our trade volume with those countries surpassed 3 trillion US dollars, creating a new driver of global economic growth and boosting people’s confidence in globalization. Moreover, China is among the first nations to provide aid to West African nations to fight the Ebola epidemic. China set up the 1-billion-U.S. dollar China-UN peace and development fund and allocated 20 billion RMB to launch the China South-South Climate Cooperation Fund, and established the South-South Cooperation Assistance Fund. China has joined the new UN Peacekeeping Capability Readiness System and has thus decided to take the lead in setting up a permanent peacekeeping police squad and build a peacekeeping standby force of 8,000 troops. As a responsible great power, China has actively participated in, advocated and signed the Paris Agreement. It is among the first countries that ratified the Paris Agreement through legislative procedures and also one of the first countries to submit to the United Nations a national action plan of addressing climate change. Based on the development achievements in the past 5 years, the 19th CPC National Congress that was just concluded made an important judgment that the socialism with Chinese characteristics has crossed the threshold into a new era. In this new era, while taking into consideration of the international and domestic situation and China’s development conditions, the CPC introduced a two-step approach to build China into a great modern socialist country that is prosperous, strong, democratic, culturally advanced, harmonious, and beautiful. In the first stage from 2020 to 2035 based on China’s completely building of a moderately prosperous society in all respects, we will basically realize socialist modernization. China’s economic and technological power will improve significantly, becoming one of the leading countries in innovation. People’s rights of equal participation and development will be fully guaranteed. A rule-of-law country, government and society will be basically put in place. Regulations in all fields will be further improved. The modernization of China’s governing system and capacity will be basically achieved. China will be much more culturally advanced, and possess stronger soft power with more and extensive cultural influence. People will be living wealthier lives. China will see a growing middle-income population and small gaps between urban and rural areas in terms of economic development and people’s livelihood. Equitable access to basic public services will be primarily achieved and great strides will be made in achieving common prosperity. A modern social governance system will take shape, and the society will be vibrant, harmonious and in good order. There will be fundamental improvement in the environment. The goal of building a Beautiful China will be primarily attained. In this new era, we will take the Belt and Road Initiative as a priority based on the principle of wide consultation, joint building and shared benefits, and make new ground in opening China further through links running eastward and westward, across land and over sea. We will adopt policies to promote high-standard liberalization and facilitation of trade and investment, implement the system of pre-establishment of national treatment plus negative list, significantly widen market access, further open up the service sector, and protect the legitimate rights and interests of foreign investors. We will balance opening-up of different regions and open the western region wider. We will grant more autonomy to pilot free trade zones to conduct reform, and explore the establishment of free trade ports to form a globally-oriented network of trade, investment, financing, production and services. China will keep participating in and promoting globalization and developing an open economy at a higher level. In this new era, China will work with all countries to build a community of shared future, and an open, inclusive, clean, and beautiful world that enjoys lasting peace, universal security and common prosperity. China will resolutely stay on the path of peaceful development and pursue an open strategy of win-win cooperation. We will uphold justice while pursuing shared interests, and build up new security concepts that is common, comprehensive, cooperative and sustainable. China will keep pursuing a prospect that is open, innovative, inclusive and mutually beneficial. We will boost cross-cultural exchanges featuring harmony within diversity, inclusiveness, and mutual learning. An ecosystem based on respect for nature and green development will be cultivated. China will continue to safeguard world peace and order, and contribute to global development. What does China’s new era mean for the world? We believe that a stably developing China in the new era will bring more certainty to the world that is infused with uncertainty and instability, and render powerful support to world peace, development and stability. ---We believe that China will build a green, low-carbon and cycling economy, firmly pursue the harmonious co-existence of man and nature, and play a positive role in improving global eco-system. China will proactively participate in the global climate governance, engage in climate diplomacy, fulfill emission-reduction promises stipulated in the Paris Agreement, and deepen international dialogue and cooperation on climate change. China will take the responsibility and priority to deliver tangible results of South-South cooperation on climate change. China and the US are the world’s two largest economies, and China-U.S. relations are the world’s most important and influential bilateral relationship. Maintaining and developing bilateral relationship is not only in line with the interests of the two peoples, but also meets the common expectation of the international community. Since China and the United States established diplomatic ties 38 years ago, thanks to joint efforts of successive leaders and the peoples of both countries, China-U.S. relations have achieved historic development. In 1979, the official exchanges between the two countries were quite few. Today, the high-level exchanges between China and the U.S. are close and the dialogue mechanisms are extensive. Since the new US administration took office, President Xi Jinping and President Trump have had two meetings in Mar-a-Lago in Florida and at the G20 Hamburg Summit respectively, which point out direction for the development of China-U.S. relations and set a constructive tone. The two sides have set up four high-level dialogue mechanisms on diplomacy and security, comprehensive economy, law enforcement and cyber security, as well as social and people-to-people exchanges, in order to communicate and coordinate more timely with each other on important issues and make good top level design. Currently the first round talks of these four dialogue mechanisms have all finished. Friends from China and the US all give credit to these mechanisms for dispelling misunderstanding, enhancing mutual trust and facilitating bilateral relations. In 1979, less than 10,000 people in China and the U.S. visited each other’s country. In 2016, nearly 5 million people from the two countries traveled across the Pacific Ocean, among which 2.6 million were Chinese visitors to the United States. In 1979, students from Chinese mainland were hardly seen in any American university. Nowadays, 330 thousand Chinese students are studying in American universities, accounting for one third of America's foreign students and becoming the largest international students group in the US. In 1979, the bilateral trade volume between China and the U.S. was only US$2.45 billion, and direct investment between the two countries was zero. In 2016, China-US bilateral import and export of goods amounted to US$520 billion, 207 times of the volume in 1979 when we just established diplomatic ties. The volume of bilateral trade service has surpassed US$110 billion. China is the third largest export market and the largest source of import of the United States, and remains the largest trading partner of the US. On the other hand, the US has become the largest trading partner, the largest export market and the fourth largest source of import of China. According to the latest report of US-China Business Council, from 2006 to 2015, the American export of goods to China has grown by 114%. In comparison, the growth of American goods export to other countries during the same period of time was only 47%. In the past 10 years, American export of service to China has grown by 348%, in comparison, the growth of American service export to other countries was only 106%. The cumulative bilateral two-way investments have amounted to 200 billion US dollars. US-China economic cooperation and trade has supported 2.6 million jobs in the US directly and indirectly. 26% of US Boeing airplanes, 56% of its soy beans, 16% of its cars, and 15% of its integrate circuits were exported to China. In the first half of 2016 alone, General Motors sold 1.8 million cars in China, 400,000 more than its domestic sales. Ford Motor Company also sold over 580,000 cars in China during the same time span. In the past year since I assumed office, I have visited governors of the nine states in our consular district and officials in charge of economic affairs, trade and investment, and strongly felt their strong willingness and dedication towards developing relations with China. Governor Bruce Rauner of Illinois, Governor Rick Snyder of Michigan, Governor Kim Reynolds of Iowa and Governor Eric Greitens of Missouri visited China this summer, giving a strong push for the cooperation and exchanges between China and the Midwest States. Chairman Emeritus of Chicago Mercantile Exchange Group Leo Melamed told me that China will be America’s economic partner for the next 50 or even 100 years. In the 2017 annual gala of the China General Chamber of Commerce Chicago held in last June, I was impressed by the zeal for promoting investment and trade cooperation from the Chinese and American business communities. There is huge potential for cooperation in economy and trade between China and America. China is implementing the Belt and Road initiative which will also benefit the US as the second largest trading partner of China. Sub-national cooperation is the foundation for friendly China-US relationship and is an endless power to drive forward the China-US relations. The healthy and sound development of bilateral relations boils down to support from people and sub-national level, and the development will eventually serve the people and sub-national level. The cooperation between China and the nine Midwest States within our consular district has expanded at a grass-root level. The economic and trade cooperation has deepened and people to people exchanges have become increasingly close and frequent. 15 sister province/state relations and 40 sister-cities relations have been set up between the two sides. Last year, trade volume between China and the 9 states within the Consular District surpassed 90 billion US dollars. In the past 16 years, China’s cumulative investment in the nine states has amounted to 20 billion US dollars, which has created 45,000 jobs. Companies like Wanxiang employ up to 18,000 local workers. Many large projects have broken ground, including the CRRC rolling car assembly plant and the Wanda Vista Tower, the third tallest building in Chicago once completed. There are 80,000 Chinese students and 19 Confucius institutes in the nine states. China’s economic development in the coming three decades will be a great opportunity for the US. China will stay committed to our relations with the US, and bring more benefits to the two peoples. First, stay committed to the right choice of win-win cooperation. The past history of China-US relationship reveals that China and the US can be partners for cooperation, and that both countries will gain from cooperation and lose from confrontation. China and the US should work as one to firmly pursue cooperation, and build a closer, more expansive and in-depth partnership featuring win-win cooperation. Second, stay committed to the strategic direction of enhancing mutual trust. There is no cooperation without mutual trust, and mutual trust comes from mutual understanding. To avoid misunderstanding and misjudgment, China and the US should view each other’s history, culture, politics, diplomacy, economics, society, military and development strategies in a holistic, objective and reasonable manner. The two countries should work in unison to strive for the best results and avoid the worst scenario. Third, stay committed to the way of mutual respect while engaging with each other. Whether it be people or countries, friendship starts from respect. It is only natural that China and the US have differences, and the key is to respect each other’s core interests and major concerns. There will be no sound and steady development of China-US relations once the political foundation of bilateral relations and basic norms governing international relations are at risk. Fourth, stay committed to cooperation while putting people’s interests at the center. As President Xi Jinxing points out, the people’s aspirations for a better life is what drives us forward. Aimed at delivering benefits to people of the two countries and beyond, China-US relationship will only develop with the participation and support of the two peoples. Only by doing so can we firmly solidify the foundation of China-US relations.